I mix it all up in a spray bottle and it seems to work well both on mirrors and windows. I recently saw a great article on window washing on the website Houzz. The tip about how to tell if a streak is outside or inside was one that I hadn’t thought about! We’ve recently done a master bath renovation (more to follow in a future post) and I was looking for a non-abrasive and non-toxic alternative for cleaning the tile, glass doors and acrylic base. A mixture of Dawn dishwashing detergent and once again, white vinegar, has been working like a charm. 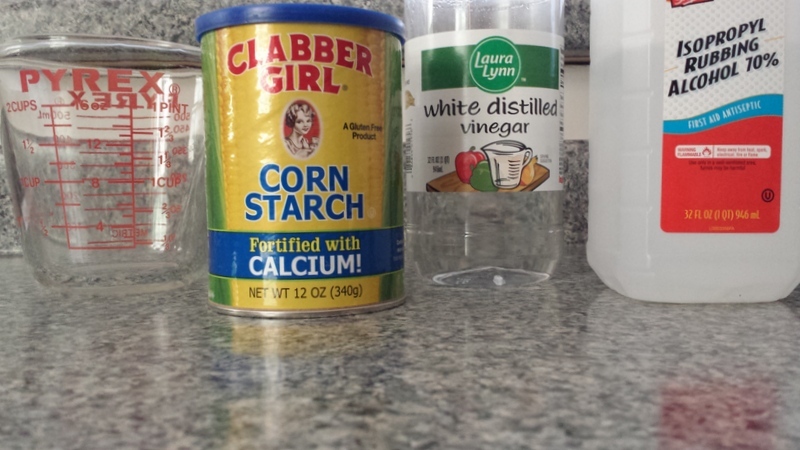 Into a 16oz spray bottle, I add ½ cup dawn and fill the rest of the bottle with the vinegar. Rug cleaning was the next chore. The runner in front of the sink in our last home is one that I wove over ten years ago. It has found a new home at the door and hallway to the studio. There is also a door from the basement so consequently, it gets a lot of traffic. I brought it out to our deck and hosed it down then used a scrub brush to clean it with a combination of Dawn, OxiClean and warm water. Dried in the sun and back in place. Not bad for a ten plus year old runner that has spent its life in high traffic areas! What are some of your favorite housekeeping tips?